It took me longer to read this one, but not because the book itself was not well written or intriguing. As the Summer (of reading) has progressed I found myself neck deep in books and for this one I just couldn’t justify the “pleasure reading” as often with two little ones running around. 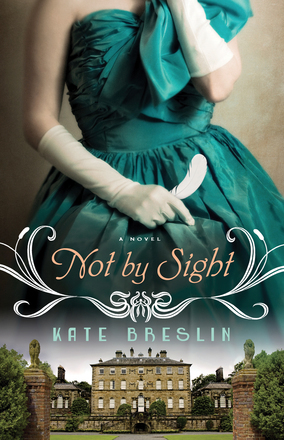 That being said… Not By Sight by Kate Breslin hit the spot. In just the right moment I was able to pick it up and finish more then half in one fowl swoop. It was a wonderful escape from my daily grind and as this historical fiction novel unfolded in England during World War I, I was introduced to the Woman Forge Corps (which actually did exist despite being little know by most) and the strong women who’s stories were woven together through the lives and romance of Grace Mabry and Jack Benningham. The strong female characters, and the sisterhood they form, was a wonderful way for Breslin to connect main and supporting characters while intertwining their stories. The novel includes women’s rights concepts, love, forgiveness, faith, and many themes that caused it’s depth and steady climb to intrigue. I wouldn’t label the novel an exciting one; but interesting, delightful, and an overall great read. It really picks up in pace during the last third and I found myself even more connected to the main, and supporting characters as the story progressed. I would recommend this book to any historical fiction buff, someone who enjoys reading about World War I or to those looking for a light and interesting read. A great vacation read! Perfect for a spot of respite in my seemingly crazy toddler-filled life. I had no major critique of Breslin’s writing and an overall delight with the characters as I finished the last page. While the novel felt resolved, there was still room in my imagination for the character’s lives beyond the story. I love that feeling when I put a book to rest. Looking forward to sharing this one with some friends in my community who share my love for historical fiction. Thanks to Baker Publishing Group and Bethany House Publishers for sending me a copy of the book so I could provide you with my honest review.